Nissan Juke Tuning and Exhaust systems from Paramount. The 1.6 Dig-t Nissan Juke is a great little turbo engine, but it suffers with underwhelming road presence. For such a striking “look at me” car, the range topping petrol turbo models including the Nismo and the Nismo RS, all creep along the road quietly with barely a whisper being heard from the exhaust of the car. For the little 1.2 engine, this is fine, but for the performance designed 1.6 Dig-t engine there should be more drama and road presence from the exhaust note. With the Nissan Juke Tuning and performance cat-back Juke exhaust from Paramount Performance, the car truly comes to life. The engine note picks up and the throttle response noticeably improves. With a clear but subtle burble when at idle, the note from the exhaust now draws more attention and intrigues those that hear it with what might come when the car is being revved and driven through the rpm band. What was once a meek, weak, and diluted whisper of an engine note, is now a more powerful and more aggressive note with the attitude that the cars design demands. The exhaust note is clear and punctuated with the Nissan Juke cat-back exhaust system from Paramount Performance. A performance, borderline motorsport, exhaust note is the result of the Nissan Juke exhaust system, but with the added huge bonus of the system being acoustically tested during development to prevent any in car exhaust drone. Many cheap Nissan Juke exhaust manufacturers simply put together cheap steel pipes with generic silencers (mufflers) and the exhaust note is just cheap with a metallic rattle and cabin drone that makes anything other than a very short journey unbearable. Nissan Juke Exhaust bore size is also important. Through testing and development, several different exhaust diameters were used to find the optimum bore to help the engine rev quicker and improve throttle response, to improve the sound quality from the exit of the exhaust and to deliver a few extra horsepower and foot pounds of torque. 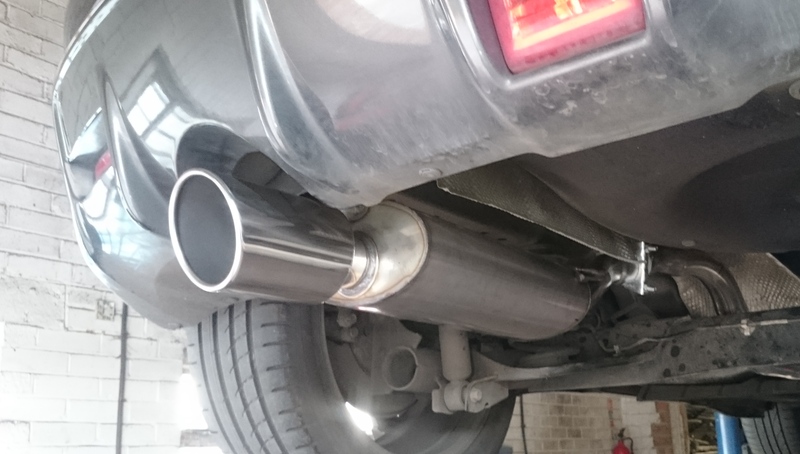 The 2” diameter is matched the standard Nissan Juke catalytic converter to maintain optimum exhaust gas velocity. This means the engine revs as fast as possible and is as responsive as possible on the gas pedal. Don’t settle for a cheap generic bolt on Nissan Juke exhausts product that has not undergone any testing or development in the real world. Do what Nissan should have done for your car and fit the Paramount Performance Nissan Juke 1.6 Dig-t cat-back exhaust system. This will transform your car and will finally make the Nismo and the Nismo RS sound worthy of the Nismo badge. Check out what else we have to offer for the Nissan Juke here, and be sure to check out the Viezu website for tuning options or mail us at info@viezu.com .